A year ago, a couple dedicated fans huddled in the cold to watch them play. Now, over 130 students and fans cheer them on from the sidelines. How did this happen? 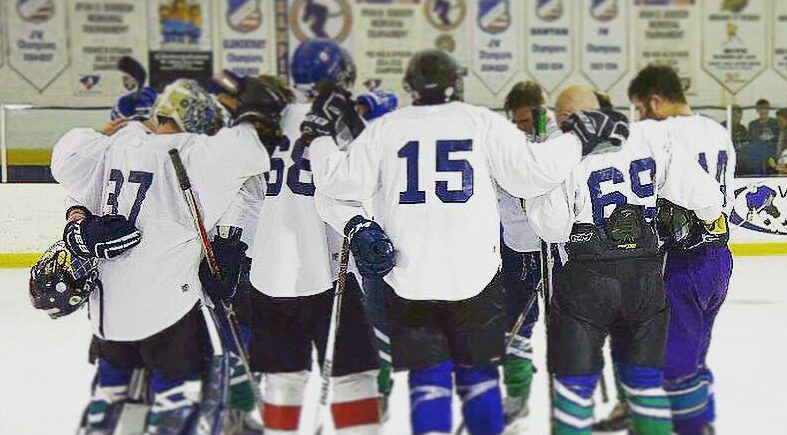 How did a passion for ice hockey transform a small group of local students into a University club team in just one year? During Fall 2017, a few students from Regent and nearby universities discovered that they shared a love of ice hockey. The fast-paced, competitive nature of the sport offered something different from other university and club sports. Why not bring ice hockey to Regent University? they asked. Together these students created a team, training and practicing throughout the winter months. Although the hockey team wasn’t yet considered an official club sport, that did not stop them from playing. During the spring semester of 2018, the team began competing with a local league. While they experienced both wins and losses, their first season helped them get their name out and allowed them to build new friendships. Since then, the hockey team has recruited players from across the nation, secured a sponsorship with the local Duck Donuts, gained official club status, and built connections with Regent students through social media. Many of the players are active or retired navy, and the players come from a variety of majors, including cinema and television, marketing, and biblical studies. Some of the first-season players who had been attending other universities even made the decision to enroll at Regent this year. In their first game of this season, the Regent Royals defeated the Narwhals Hockey Club 11 to 4. More than 130 students and fans showed up to watch the game. “It may sound cliche, but I think it brings hope. If students want to do a club – if they want to put in the time – they can have it happen,” he added. One of Regent’s main goals is building Christian leaders who will take initiative in changing the world. Part of that begins with students taking initiative and leadership in Virginia Beach – in the buildings on campus or the ice rinks up the road. Check out the Hockey Team’s page for upcoming games.